Cancelations are one hour's notice, too! With our license, we have a maximum of 16 spots available for each hour. 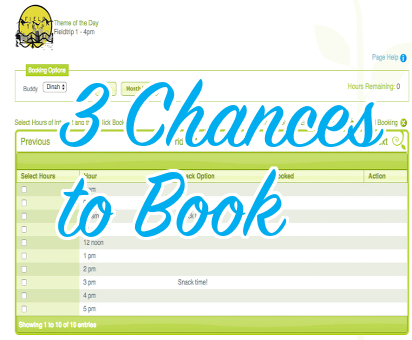 At the beginning of the month, 4 months in advance, 12 spots are made available for each hour of the day. At 6am, 2 days in advance, 3 more spots are released. Once twelve spots are filled, members can set the alarm clock to catch the second wave! At 6am, 2 days in advance, 3 more spots are up for grabs! You can also check back. Adding a second membership is only $10/mo., no matter what type, and access to both locations means you've got 6 options! If you miss out at Broadway, login at Storybook, and book in on the East side. For changes to day-of reservations, families can call the centre (with one hour's notice); however, we are not be able to accept bookings or cancellations via answering machine message or email. Now that you know when you're coming, read more about what to bring.